GE's MDS™ Intrepid HC products offer a long-distance, high capacity point-to-point licensed wireless backhaul solution ideal for industrial and commercial-grade applications. MDS Intrepid HC MX and Intrepid HC OIP provide highly secure, time sensitive and mission critical communications backhauled to a centralized location. Offered in the traditional FCC/ETSI microwave frequencies between 6 GHz and 38 GHz, these devices can be used globally in developed and developing countries. The MDS Intrepid HC MX operates in the licensed 6 to 38 GHz frequency bands and offers throughput capacity between 8 and 350 Mbps. It provides a flexible combination of native TDM and native Ethernet interfaces and supports STM-1 interfaces. The MDS Intrepid HC MX can be configured for non-protected (0+1), protected (1+1) or space diversity deployments. 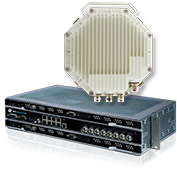 The rich feature set and interface support of native Ethernet and TDM provide maximum throughput with minimal latency. 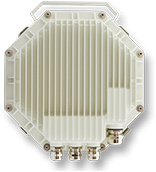 The MDS Intrepid HC OIP operates in the licensed 7 to 38 GHz frequency bands and offers throughput capacity of up to 350 Mbps. As an all-outdoor radio terminal, supported by an outdoor PoE unit, the MDS Intrepid HC OIP eliminates the need for rack space within shelters, cabinets, and enclosures. The radio mates directly to the back of its associated antenna, minimizing visual impact. Power to the radio is provided by the PoE unit over the same Cat5e Ethernet cable that provides data to the unit.